Lexia Barzane | The Ego Co. Between 24th October and 1st November 2012 the Ego Co will be hosting the Costume Ball. Various designers have items for sale that are totally suitable for a lovely posh costume ball so extremely classy with a hint of darkness just in time for Halloween and that’s my kind of ball! I adore this mesh dress by Happy Undead which you can buy at the Ball and calling it the Black Widow dress is so perfect, its total glamour and shows of all your best curves. It goes especially perfectly with the Femme Fatale skin created by Pink Fuel. The face is gorgeous with very striking make. I don’t want to take her off! 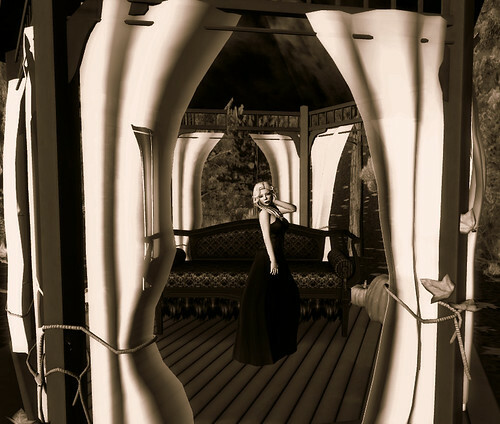 I am also posing inside the Harvest Night Gazebo by Cheeky Pea and in front of the Nevermore Settee by Synjari Myriam of Senzafine which is super comfy to have a rest on or just watch the world go buy.